THE FRY, A darling of our nostalgic taste buds, is not so much an everyday breakfast anymore – but we love it nonetheless. There is much debate as to what’s right and wrong. Putting together the perfect breakfast does not come without its challenges. Food writer Georgina Campbell, who runs the annual Irish Breakfast Awards, points out that what should be on the plate depends on the region. “The traditional basic fry may start with rashers, sausages and fried eggs, but there are many regional specialities,” she says – mentioning potato bread in the North, boxty in the North-West and black and white pudding which used to be a Cork thing but is now pretty much universal. And of course the Irish fry has quite the reputation around the world. The late Anthony Bourdain tucked into a full Irish in an early house when he popped to Dublin for his show The Layover. And more recently Phil Rosenthal from Netflix’s ‘Somebody Feed Phil’ came to town and went on a breakfast journey. He tried a perfectly good Turkish eggs menemen and moved onto pimped up porridge, but only looked truly content when he got to sit down in Darina Allen’s kitchen and tuck into a proper fry. There is no doubt sausages take pride of place on the breakfast plate. Anyone who’s been out of the country for more than a day will have heard (or indeed lamented themselves) that there’s nothing like an Irish sausage. We’ve a great tradition of brilliant pork products that come into their own for breakfast, so it seems the only question is: How many sausages actually belong on the breakfast plate? Chef Paul Flynn tells me he’s happy with one, but knows this isn’t a popular opinion. Writer Leslie Williams reckons two or three are essential as do many fans, according to a hearty debate started on the matter on Twitter. The general conclusion I found is if you’re going big and artisan for the sausage, one can sometimes be OK – but two is preferable. If you go for the classic plain pork sausages that tend to be a bit smaller, put three on the plate just to be sure. Along with sausages, bacon, eggs and pudding are the other essentials in all descriptions I came across of an Irish fry. Bacon, rashers, whatever you call them, these salty, umami slices simply belong on a breakfast plate. Most people seemed to favour back bacon, at least two slices and a bit crispy, but not the ‘crispy’ you’d find on a stack of American pancakes. Pudding is a no-brainer. Include it or you are missing out. I prefer just black but if the white is there, throw it on. And the eggs? Don’t be fooled by thinking eggs are the easy part. Fried eggs it is, scrambled or poached shouldn’t get a look in. And if you don’t serve that yolk a bit runny, breakfast can be ruined. So how to get it right? Firstl, use a clean pan and clean fat to cook – do not cook your egg in the remains of your fried meat (but this is exactly what you should fry your bread in, if you are frying your bread). Cook the egg slowly and gently, basting the whites with the fat as they cook. Drain your eggs before serving, you can even trim them a little if needed but whatever you do – make sure the yolk is runny. A yellow, jiggly runny yolk can make or break your entire plate. It’s a unanimous opinion that bread is a very important component, but the choice of baked goods is about as varied as it gets on the breakfast plate. Paul Flynn insists that when he’s cooking at home nothing but fresh, squishy sliced pan is acceptable, smothered in butter. Clodagh McKenna likes classic, homemade soda bread on the side. Hilary O’Hagan Brennan tells me: “Never too many bread options in my books!” She’s a fan of soda bread too, but cooked on one side only. She adds that in recent years she was introduced to soda farls and potato bread by her husband’s family from Monaghan. The bread it seems changes quite a lot depending on your geography. Whatever bread you go for, don’t be stingy. Remember there’s lots to be dipped and mopped up. Gaz Smith from Michael’s in Mount Merrion wants extra bit of toast with his “for having with marmalade as a dessert”, as does O’Hagan Brennan: “The finisher is saving a bit of toast to have with marmalade afterwards as a dessert course.” Wondering now if I need to add marmalade to the list? Beans probably cause the most debate. Lots of people are a flat-out no to beans but experience and my own preference makes me lean towards giving beans the OK. I do wholly agree with Paul Flynn though who tells me: “If you you’re having beans, they need to be served separately so as not to swamp the breakfast.” So I’m going with a yes for beans, but definitely optional and definitely on the side. I don’t really care for them on my breakfast, but they do seem to sneak into every fry up photo and every menu so do they belong? Darina Allen even serves them up on the breakfast plate to Phil Rosenthal, but they are never mentioned. Tomatoes, I conclude are simply there as a garnish. Add them if you want some colour on your plate, no-one’s taste buds are going to thank you, although it might look good on Instagram. Many say if your eggs are right that’s all the sauce you need, but otherwise, it’s a simple choice between red or brown. For Hilary O’Hagan Brennan, though, they are paramount. “Never underestimate the importance of condiments in a fry. I’m a fan of ketchup or brown sauce, depending on the day. But always sauce, don’t forget the sauce!” I would tend to agree. Get the kettle on, this one is fairly unanimous. Almost everyone I talked to insisted tea, or in fact ‘tae’ was the only thing to wash down your morning feast. In fact wine writer Leslie Williams gives tea with fry the critic’s thumbs up, informing me that the tannins in the tea go so well with breakfast as they cut through the grease. Can’t argue with that. Don’t hold back, if you’re making a mug, make it big and strong. In fact most would be in favour of a good old steaming pot. And top it up halfway through, you’ll need more. Chips. 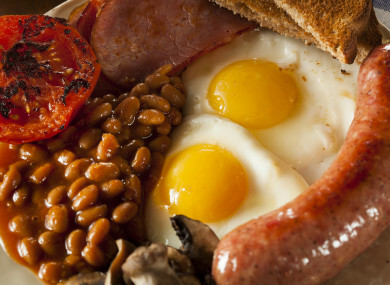 The addition of chips will ruin your breakfast and in fact make it into an English breakfast or a mixed grill. Just don’t risk it. And I couldn’t bring myself to include hash browns. I think they should stay in breakfast rolls where they belong. What do you think? Have I figured out the fry? Email “The Perfect Full Irish: How to make the ideal fry, according to the experts”. Feedback on “The Perfect Full Irish: How to make the ideal fry, according to the experts”.